The Curriculum DaVinci provides Science and History embedded in themes. It is time efficient: all materials are included in ready-to-start packages and it is suitable for grade classrooms. Additionally, the curriculum is adapted for Cosmic education with digital school boards, mind maps, and 21st century skills as well as for Christian education (“Together on earth”). At present, only information about the curriculum DaVinci is accessible for international use. Time efficient by integration of the subjects. All attainment targets concerning “Self and world orientation” are covered in a continuous curriculum from Pre-K to grade 6. Little preparation time: (approximately 10 min. a week) all materials will be delivered in ready-to-use packages. 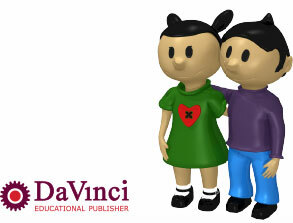 DaVinci works on a solid knowledge base: children will be taught knowledge to build their skills and competencies on. Custom made materials as well as diversity in processing: DaVinci is suitable for all children. It is also suitable for grade classrooms with a elaborated class management and cooperative learning. Learning in context: parents and institutions in the school surrounding will be actively engaged. Adapted to modern times: it is compatible with digital and Smart boards, online assignments, mind maps, higher order thinking, Science & Engineering, and 21st century skills. High-quality education: promoted by the University of Twente – Twente Academy Young. Talented teachers as experts: we return the “power” to the teacher because they are the directors in classrooms. Want to stay informed about the activities and development of new teaching methods published by DaVinci?